Head of United Steelworkers local, Chuck Jones, called out Trump for claiming 1,000-plus jobs saved, said company confirmed it would retain only 730 union jobs and 70 nonunion. Union leader first said he congratulated Trump on the deal - then, a week later, changed his mind. Indiana [and Carrier] officials said Dec. 1 the deal involved “preserving 1,069 high-wage jobs”. 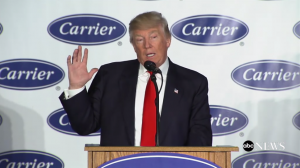 Jones said the number of Carrier jobs actually saved is about 800. The ~1,100 jobs figure included some 250 headquarters and engineering staff positions which the company had always said would remain in Indianapolis. 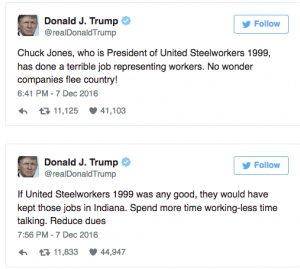 Trump tweeted about the criticism of the Carrier jobs deal from Chuck Jones, President of United Steelworkers. Trump makes a good point about the impact of regulations and of union effectiveness in Indiana. The larger issue of union effectiveness everywhere also needs to be addressed.